Hydropower is one of Southeast Asia’s biggest renewable energy sources, however, many still remain oblivious to the damaging side-effects of hydropower projects. According to the International Renewable Energy Agency (IRENA), hydropower capacity in the region grew almost threefold from 16 GW to 44 GW between 2000 and 2016. 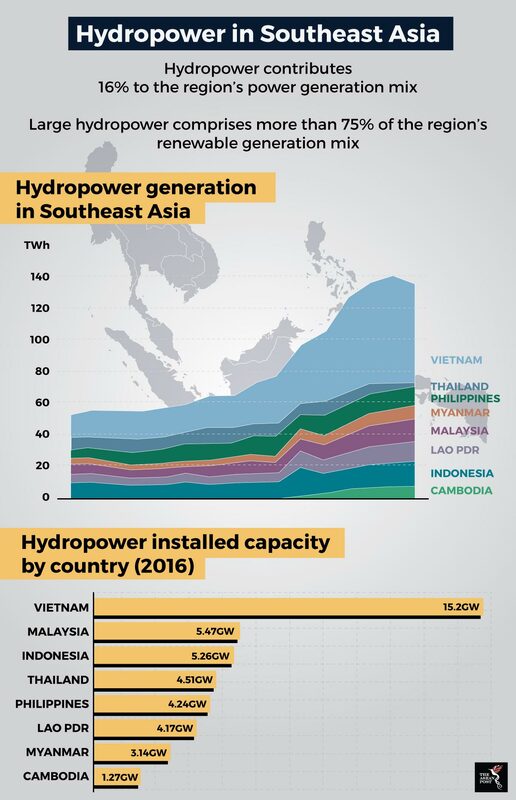 Currently, the use of hydropower is most prevalent in Vietnam, Lao PDR and Thailand, which take advantage of the Mekong River flowing through their respective borders. Data from the World Energy Council indicates that in terms of installed capacity, Vietnam leads the way in Southeast Asia with 15,211 megawatts (MW). One of the main reasons behind the uptick in hydropower in the region is due to ASEAN’s collective target of reaching 23 percent renewable energy by 2025 in the ASEAN Energy Mix. This is also compounded by the fact that more governments are slowly beginning to realise the consequences of being too reliant on fossil fuels. Another major factor encouraging hydropower use in the region is the forecasted growth in energy demand. The International Energy Agency (IEA) predicts that Southeast Asia’s overall energy demand is expected to grow 60 percent by 2040. As such, there has been an increase in plans to develop more hydropower in the region. Many countries are now taking advantage of the numerous rivers flowing throughout Southeast Asia to start new hydropower projects. For example, Lao PDR, a country that aims to be the battery of Southeast Asia is currently constructing 46 hydropower plants and aims to have 100 hydropower plants by 2020. Myanmar on the other hand has enormous hydropower potential waiting to be tapped. Myanmar has a potential hydropower capacity of 108 GW. The government of Myanmar has already embarked on more than 40 hydroelectric dam projects in major rivers around the country. Five of these projects are considered mega-dams with a potential power output of over 1,000 MW each. As the hydropower energy sector booms in the region, many investors are starting to gravitate towards these projects. Institutions such as the Asian Development Bank (ADB) and countries like China are reported to have invested in numerous hydro projects. China in particular has been actively funding many projects along the Mekong. DBS bank has reported that the regional market for investments in hydropower is valued at US$90 million. While the proliferation of dams and hydropower generation in the region may seem like a positive step, many are unaware of the irreversible damage such projects could cause. One of the chief concerns with hydropower is the environmental harm it could cause. “Hydropower has degraded some of the most biologically rich habitats on our planet,” said Professor William Laurance from James Cook University in Australia. Lao PDR’s plans of building more hydropower plants has already drawn the ire from activists. They are citing a Mekong River Commission assessment highlighting that it would cause irreversible damage to Lao PDR while also affecting downstream countries. The assessment revealed that the natural flow of the river would be altered and more than 50 percent of it would be turned into ‘stagnant reservoirs’. As a result, this would obstruct vital fish migration routes and could cause the loss of between 26-42 percent of annual fish stocks, costing up to US$500 million per year in downstream countries. Also, the report mentioned that iconic and endangered species such as the giant Mekong catfish and Irrawaddy dolphin could be driven to extinction. Not only do large hydropower projects affect the surrounding environment, their construction also harms local communities in the surrounding areas. In Malaysia for example, the development of the Bakun Dam has been met with protests from the local indigenous communities there. The construction of the dam has displaced people who have been living there for generations. Furthermore, the construction of the dam has led to the relocation of 9,000 people living within the area due to floods. Building the dam has also caused the indigenous people living in the area to become vulnerable to waterborne diseases such as malaria. There is a myriad of other instances where corporations and governments ignore the feedback of local communities, scientists and activists in the pursuit of profit. Examples include the Tasang Dam and the Myitsone Dam in Myanmar. Rarely after intense pressure from various groups and organisations, a project may be canceled or suspended. This is normally a rare occurrence as local grievances are usually brushed aside and ignored. Pursuing hydroelectric power is not inherently wrong. Proper planning needs to take place while local objections need to be addressed first before the bulldozers start rolling in. Implementing hydropower projects to make our energy needs more sustainable but dismissing local concerns and damaging the environment will only take us one step forward but two steps back.